Starting in April, the yellow carrier will have 5G towers available in Chicago, Dallas, and Los Angeles. Atlanta, Houston, and Washington, D.C. will get the 5G treatment, or what Sprint calls Massive MIMO, later this year. Sprint's Massive MIMO technology (band 41) will supposedly boast speeds up to ten times that of LTE, which should help with network congestion (insert jokes about Sprint and its network here). With the rollout, the carrier will deploy 64T64R radios on its towers, which are capable of split-mode, i.e. offering LTE and 5G on the same radio. 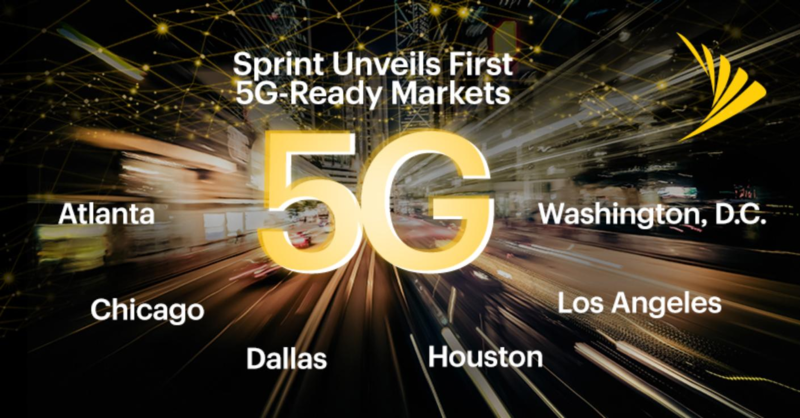 Sprint is particularly proud of its spectrum holdings, claiming that it is uniquely positioned to offer both LTE and 5G at the same time over 100-200MHz. Over the coming months, Sprint will upgrade its towers to offer triband service (800Mhz, 1.9GHz, and 2.5GHz), as well as add new cell sites and smaller nodes to increase coverage and network density. The upgrade to 5G is heating up, meaning that we as consumers can only benefit (except having to buy the compatible phones). Exciting stuff.